3 tracks from Chicago to Tower A-5. CTC in use, controlled from Metra's Consolidated Control Facility, by Tower A-5 Dispatcher. During nights and weekends controlled by Metra Southwest Dispatcher. Manual interlocking at Tower A-2. 2 tracks from Tower A-5 to Rondout, CTC in use, controlled by CP Rail dispatcher in Minneapolis. 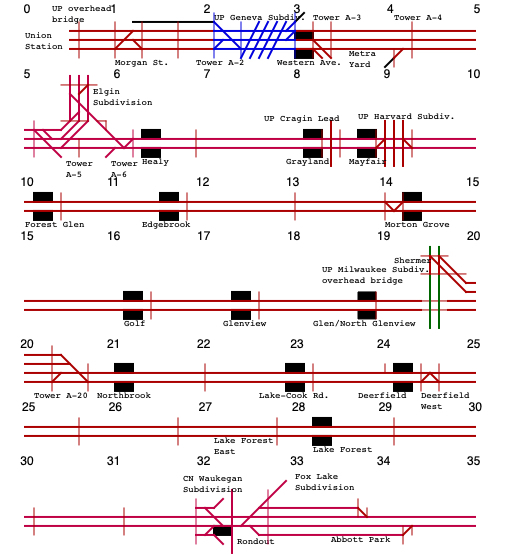 Track diagram as the main line to Milwaukee existed around 1960, prior to the installation of CTC. CTC was installed between Tower A-5 and Rondout around 1980.